Don't worry, LG hasn't given up on modules for the LG G6! So, LG just launched its metallic V20 phablet and people couldn't help but notice that, while it does have a latch button similar to the one of the G5, it doesn't really have a spot for modules (or Friends from the LG Playground). This could easily lead to speculations that the G5's underwhelming sales and lukewarm reception to its initial modules caused the company to quickly change course, giving up on the concept. 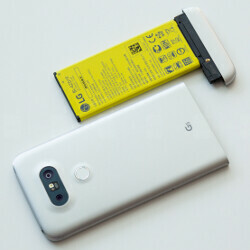 However, LG spokesperson Ken Hong wants to disperse any such rumors before they become prominent. According to him, the V20 was conceptualized and design choices were well in their final stages when the G5 was released, and the sales figures of the latter made little impact on the V20's final form. Apparently, the company just didn't imagine the phablet as a modular phone the way the G5 is. Additionally, Mr. Hong continued to say that LG is still dedicated to making modules work, and next year's G6 will develop the concept further. Whether this would bring more variety in modules and whether they would be interchangeable with the G5's add-ons remains to be seen, of course. So, there you go. Despite how the LG V20 made it look for a while there, LG modules are not dead! That's a relief. My LG Rolling Bot is so cool. I'm gonna get the next 'Friends' mods if the G6 doesn't dissapoint. I think it's a bad decision. The modularity is one of the reasons why LG sold so little G5s. If the G6 will keep it, we'll see another fail. I'm happy they ditched it in V20. ...But have modules given up on LG?